Here you will find a small reading list for medieval philosophy. It should be noted: when talking about the history of philosophy we must separate the primary texts from the secondary literature. So, this medieval philosophy booklist will be separated into the most influential primary texts in the history of medieval philosophy, essentially what comprises the content of historical study of medieval philosophy, and then some of the corresponding secondary literature on these sources. As far as the primary sources are concerned, I included Augustine, Boethius, Anselm, Abelard, Aquinas and Duns Scotus. These six are, in my opinion, the major players in the Middle Ages. Some might argue for the inclusion of Bonaventure and/or Ockham at the expense of Abelard, so let me justify my pick. Many in academia have rightly pointed that the later quodlibetal format utilized by Aquinas and Ockham, as well as others, is an evolution of Abelard’s Sic et Non. Though Anselm is most often noted as the founder of scholasticism, Abelard was much more radical in his dialectical approach and methodology, serving as an important bridge between Anselm and Peter Lombard’s Sentences, which was the primary textbook for philosophical education in the Middle Ages. So, if we are discussing the most influential philosophers of the Middle Ages qua philosophers, Abelard is in his rightful place among the top six. If we were to recast this list as the most influential philosophers of the Middle Ages qua theologians, Bonaventure and/or Ockham could duke it out for spot number six. As far as the secondary literature is concerned, I only included two sources on particular figures, Augustine and Aquinas, because they are, arguably, the two most influential figures of the period. Rist’s monograph on Augustine was extremely successful and masterfully demonstrates the dependence early Christian philosophy had on the NeoPlatonic tradition. Among an increasingly growing and vast pool of secondary literature on Augustine, Rist’s Augustine: Ancient Thought Baptized, remains one of the most respected and continually visited monographs by contemporary scholars. Though there is similarly, a massive amount of secondary literature on Thomas Aquinas, Stump’s monograph treats him in a rigorous, analytic fashion, delivering a comprehensive overview of the Angelic doctor’s philosophical framework and method. The other two texts, History of Christian Philosophy in the Middle and The Cambridge History of Medieval Philosophy both provide glances of the period as a whole, but approach this dubious task in very different ways. Gilson’s book is perhaps the most cited historical analysis of medieval philosophy in the twentieth century, providing a meta-narrative in one singular voice. The Cambridge History of Medieval Philosophy has an impressive collection of essays from nearly all the top scholars in medieval philosophy, including essays on historical context, analysis of particular thinkers, and numerous thematic considerations. In my opinion, it is an indispensable aid to anyone in history of philosophy, most particularly medieval philosophy. 1. Augustine, Confessions, trans. Henry Chadwick. (Oxford University Press, 2009). 2. Boethius, Consolation of Philosophy, trans. Joel Relihan. (Hackett, 2001). 3. Anselm, Proslogion, trans. Thomas Williams. (Hackett, 1995). 4. Abelard, Scito te Ipsum , trans. David Luscombe. (Claredon Press, 1971). 5. Aquinas, Treatise on Happiness & Treatise on Human Acts, trans. Thomas Williams with commentary by Christina Van Dyke. (Hackett, 2016). 6. Duns Scotus, Philosophical Writings, trans. Allan B. Wolter. (Hackett, 1987). 7. Gilson, Etienne. History of Christian Philosophy in the Middle Ages. (Random House, 1954). 8. Rist, John. 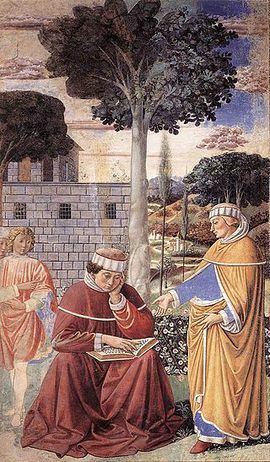 Augustine: Ancient Thought Baptized . (Cambridge University Press, 1994). 9. Stump, Eleonore. Aquinas. (Routledge, 2008). 10. Pasnau, Robert, and Christina van Dyke, eds. The Cambridge History of Medieval Philosophy. (Cambridge University Press, 2010). This page was last edited on 7 December 2017, at 14:14.